I wont lie to you, I’m in a slump right now. I’ve decided to quit biology and work towards what I really want to do. In order to do this I need to get a job to save up funds, any job. Even though I’m not picky and pretty much applies for any job that I see it’s still going to be hard, because that’s just what the times are like right now. I spend my days looking for jobs, pondering on whether I did the right choice regarding the biology or not and listening to various songs from the Warm Bodies movie (no, I usually don’t like teenager – 20 something romantic comedy movies, I don’t know what’s gotten into me). Sometimes things feel rather glum. I get pessimistic and feel old because by now I’m supposed to have a bachelor’s degree, if I was anything like those other young successful people, but I don’t have any degree and I wont get one either. Life doesn’t always take you where you thought you wanted to be. I thought I wanted to be a biologist and I believed in that dream and I’ve been chasing it since I was 16. It’s hard realizing that you want to do something completely different, you sort of need to reprogram your brain. And if you’re like me and identify yourself with what you’re doing or with what you’re going to do in a few years you either need to adapt to this new identity or realize that you’re not your job. I’m not naive anymore. I know I’ll need to work hard to get to where I want to be. I know I’ll need some luck. I’ll need some contacts. And funds. But I have, after thinking unconsciously and consciously about this for years, realized in the last two months that this is the only thing that I want to, and can, do. I’m cut out for this job, I’m made for it. And I’d be damn good at it, too. So in the meantime while my head is buzzing and I alter between pessimism and optimism I’m baking easy things, like these biscuits. I stole the recipe from Matgeek but changed it slightly because my home made almond paste was quite soft and not very sweet, I added some extra sugar and a bit more flour but I’ll give you the exact recipe that you see on his blog because the almond paste you’ll be using wont be like mine. And don’t use marzipan, you need to use almond paste. Almond paste is like marzipan but with a higher almond content. In Sweden there used to be a rule that said that almond paste had to contain at least 50% almonds but that’s not the case anymore, however, I’d recommend it. Just make your own if you can’t find any. I also used cherry jam instead of raspberry but you can use whatever you have that you think will be tasty. Mix the butter with the almond paste until you have a smooth mixture with no lumps. Mix in the flour, as when making short crust pastry you don’t want to overmix, just rub the butter and the almond paste together with the flour until it’s just come together. Put it in the fridge for at least an hour covered with cling film. Divide the dough in two and roll them into two logs that you then roll in the almond slivers. Put in the freezer for an hour. Put the oven on 190 degrees C/374 degrees F (165 degrees C/329 degrees F if you’re using a convection oven). Slice the logs into 4-5 mm (about 0.2 inches) and put them on a tray lined with a baking sheet. 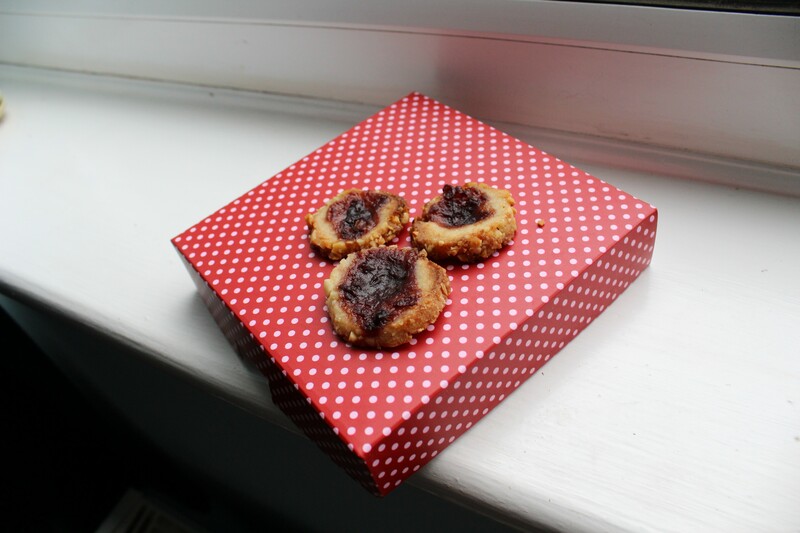 Make a slight imprint on the biscuits and put a tiny blob of jam on each. Bake in the oven for ten minutes or until they got a bit of colour but aren’t brown. This entry was posted in Biscuits and tagged almond paste, almonds, biscuits, cherry jam, jam, regenter. Bookmark the permalink. I can relate to how you are feeling, and I wish you the best of luck! I am sure you can do it, no matter what your new goal is. I always used to feel kind of like a failure for not pursuing a degree (still do sometimes to be honset, it’s a constant battle since my older brothers both have degrees and going after more). But when you have a dream or a really strong gut feeling telling you what you really want to be or do, you just need to go for it. Even though it’s tricky and will probably be hard and now and then you will wonder if it’s worth it. But it is!